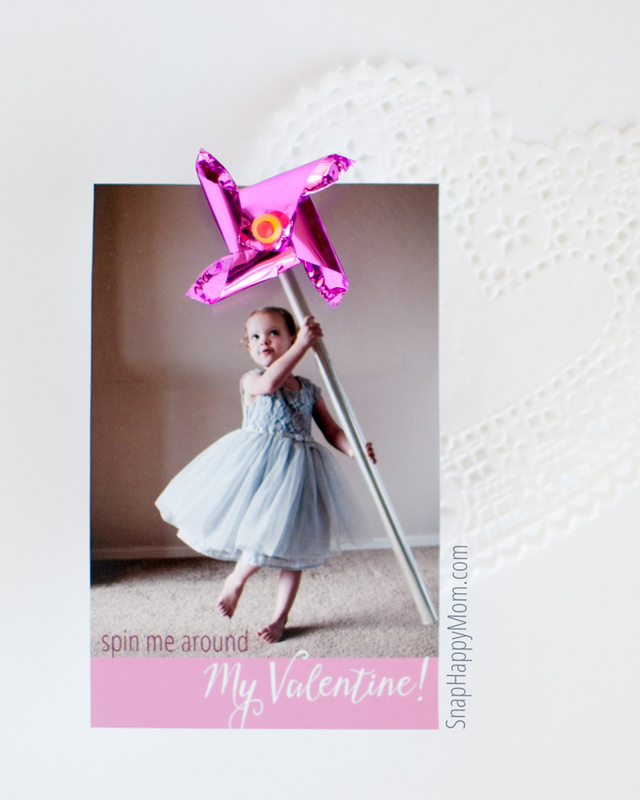 Spin Me Around, My Valentine. 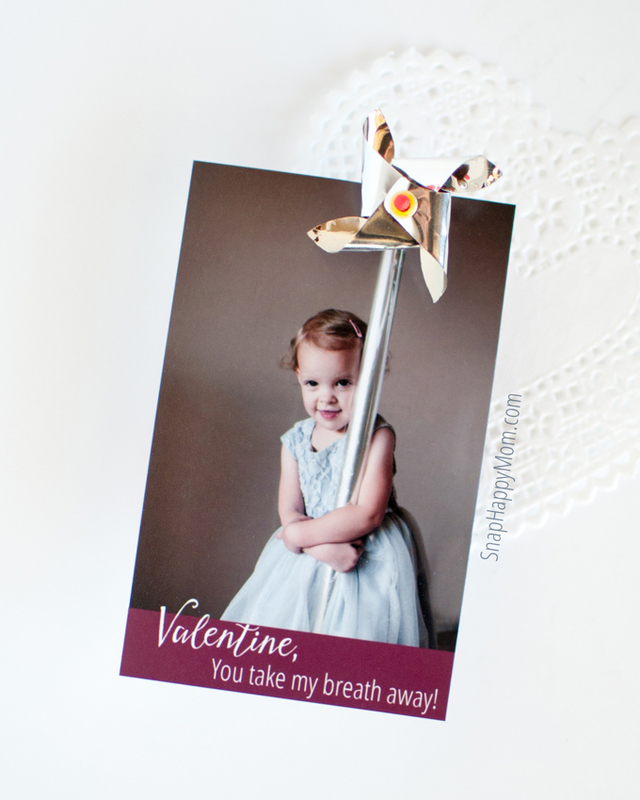 Valentine, You Take My Breath Away! Want to make some of your own? It’s quick and easy! Find a place in your house with a blank wall and good lighting. You want bright window light that is not direct sunlight. I love the excuse to take a special picture, so I put my daughter in a pretty dress! I find that 2-4 year old children do well in a photoshoot if they have a prop to hold. We used a roll of clear cellophane wrap to look like a long stick on a pinwheel, but I’ve seen people use a pvc pipe as well. The cellophane looked classy and worked perfectly… just tape down the edge so it doesn’t unroll! 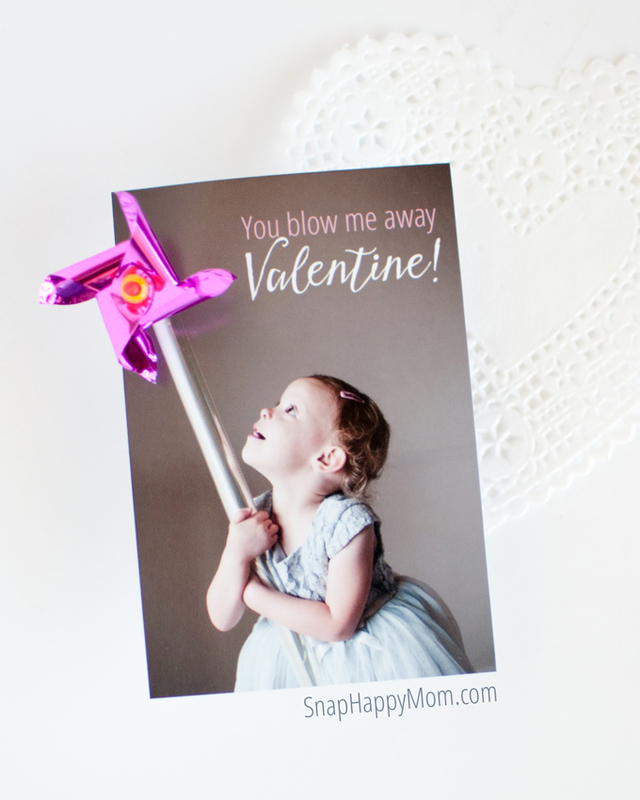 Take a vertical picture of your child holding the cellophane roll (it’s tricky to make sure the hole for the pinwheel isn’t too close to the top of the photo if it’s horizontal). This type of photo tends to work best if it’s a straight on shot, so you probably want to get lower. I prefer to be at eye level with my subject, which almost always means I’m on my knees! If you have a DSLR, make sure your depth of field is wide enough to including your child’s face in focus, but your shutter speed is fast enough to freeze motion. My shutter speed was at 1/320 of a second, and which allowed me “freeze” her spinning motion in a photo. Under no case should you be slower than 1/125th of a second indoors shooting children, and most cases require a much faster shutter speed. 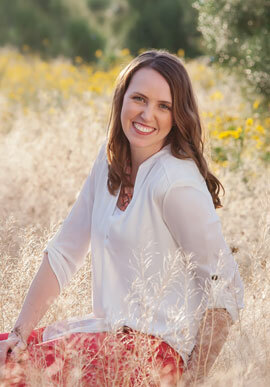 My aperture was set at f/2.5 on a 35mm lens, and I was about 6 feet away from my daughter. That leaves me enough depth of field to keep her face, body, and prop all in focus. My settings are just recommendations, since a lot will depend on your available light, but don’t be afraid to bump up that ISO to get a fast enough shutter speed! I just handed my daughter the prop, and started snapping pictures. I find it easier to see what they do with the prop first, and then direct them after awhile. You can ask her to look up, spin around, or play peek0-a-boo with you. Just try to make sure that the top edge of the “stick” doesn’t go out of the frame, nor get too close to the child’s head. I printed my photos at 3×4” by putting two on a 4×6 photo and cutting it in half – just the right size for the mini pinwheels! I added the caption in Photoshop, but Picmonkey should work as well. Just make sure you leave room for the pinwheel not to cover up your caption! This is the packs of 24 mini pinwheel cupcake toppers I originally ordered for the valentines, although I’m not sure if it’s still available. (This 12 pack of toppers is the same although it’s not prime). The pinwheels are an inch across, and work perfectly! They come in a pack of 24 with red, pink, silver, blue, yellow, and green – they can work for girls or boys! The pinwheels are attached to toothpicks, which made me a little worried about school-age kids poking someone. I solved this by trimming the sharp point off the toothpick with kitchen scissors, and then running it along a metal file to smooth it out. Taping the toothpick down on the back will help too. Use an exacto knife to carefully cut a quarter inch slit on your picture, right at the top of the cellophane “stick.” Carefully insert your pinwheel, and add a piece of tape on the back to keep the it in place. Tada! 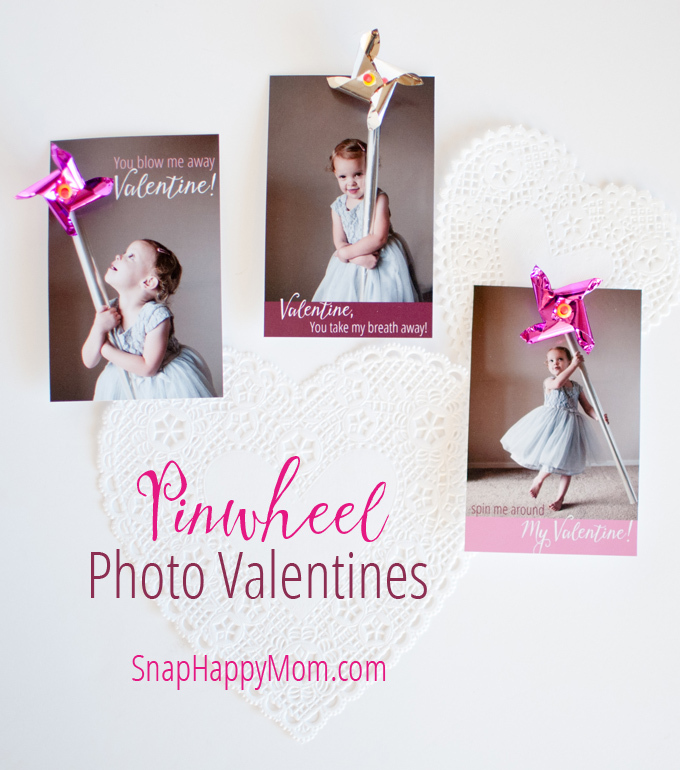 You have ADORABLE Mini Pinwheel Photo Valentines! 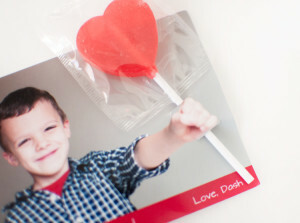 You may also like these tips on how to take the perfect photo for a Lollipop Valentine here! Great idea, cute pictures too! These pictures are adorable! I love the one where her dress is flared out. So cute. Can you explain in a future post more about what you meant by “makes sure your depth of field is wide enough to including your child’s face in focus, but your shutter speed is fast enough to freeze motion.” I’m a beginner and don’t know how to do this. Thanks! I went back and added some more information to the post to clarify this. Thanks for letting me know! This is so cute! I love how it’s a simple idea that you could recreate for all sorts of things. I’ve seen a lot of valentines like this but never knew how they took the pictures so this is perfect… Thanks! I love these!! Such a cute idea! This is such a cute idea!! I love nonfood Valentines. Seriously – the sweets intake gets absurd around the holidays! Super cute! Thanks for giving the settings for DSLR cameras. My husband keeps telling me to “take it off of auto” and actually use my camera. These are adorable! If only I was crafty enough… Haha.